Pebble Beach is one of the most beautiful and iconic destinations in the world. It’s as close to a perfect place for golf as we have ever been, and it may have just gotten a little better. Earlier this week, IBM and the Pebble Beach Company announced the launch of an app that was built using the computing giant’s Watson’s cognitive capabilities. The app, which was developed for the resort’s visitors, acts as a virtual tour guide around the property and 17 Mile Drive. 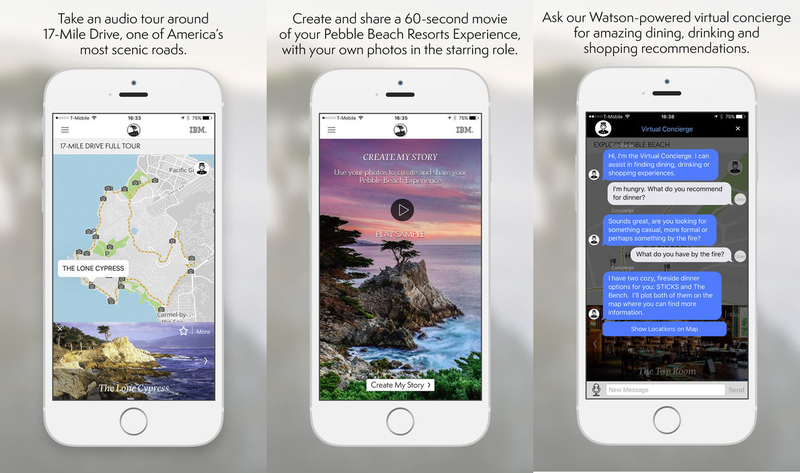 Visitors can use a virtual concierge to locate dining and shopping options, explore the resort, and experience guided tours of 17 Mile Drive. User’s can even create their own 60-second video using their own images and share it to social media through the app. Reece and Hamilton on the 18th at Pebble Beach. The app also will notify users about dinner and shopping specials. Hamilton and Reece found a smoked-meat special they had to try, and also discovered how Ghost Trees got its name. “The informativeness added to the experience, and we wouldn’t have had that without the app,” Hamilton says. The couple also discovered a benefit IBM and Pebble Beach probably hadn’t intended. “We didn’t even fight because we didn’t have to ask for directions,” Reece says. “Only for certain things,” Reece says.